Wow what a busy month it's been! Finishing ends, adding buttons, posting parcels! Then BAM along comes Halloween and I get totally creatively snowed under! I've also added some photos below of my hats, and all the patterns from this year! Nevermind! 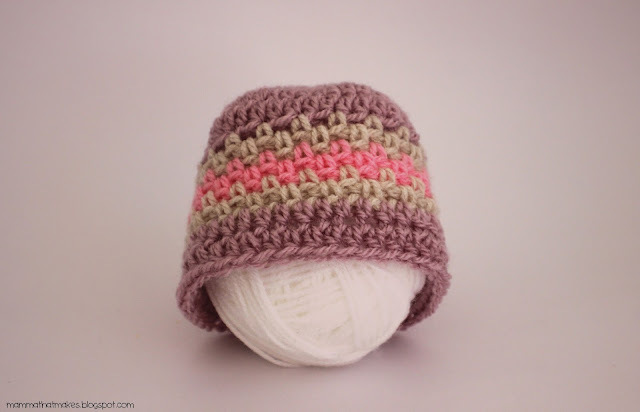 Today I'm here to give you the tally for the 2017 Itty Bitty Giant Hat Drive, for the number of hats that have been received throughout October by Chance's Clothes Project. Oh! My! WORD! Lovelies, I just can't even. I have goosebumps! Honestly! Two thousand, nine hundred and seventy nine hats! Let me break that down a bit. At 3 hats per pack, that is enough hats for 993 packs. WOW! Gals, have you got any idea just how incredible that is? That's insane right there! You guys pulled together and did something completely mind boggling AMAZING this year and I can not thank you enough! I'm sitting here looking at these number, while Im typing, with tears in my eyes. What an honour you have all done. What an amazing display of support and understanding and caring. There will be hundreds of families, that will now, because of YOU have something size appropriate for their angel. Hundreds of families that will know they are not alone. That will know someone out there cares. You guys hit it out of the ballpark, and I am so proud of each and every one of you who joined in. Thankyou, from the bottom of my heart. Also, please remember that this tally was for hats donated to CCP only. 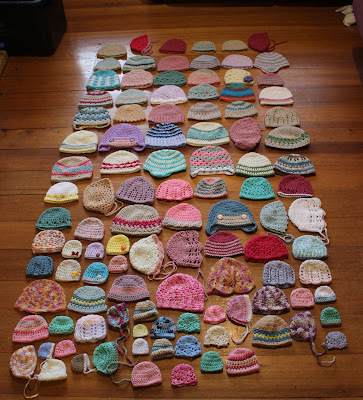 They are whom I work with each year in Australia as the beneficiaries of the hat drive. There are most likely many THOUSANDS more hats that have been donated worldwide as a part of the IBGHD that I don't know about, and that is even more incredible!! Every year it does get harder to come up with more designs, it's much more challenging. But, I have never let a little challenge stand in the way! So yes, we will absolutely be back again next September! Whether I have 30 completely new patterns, or a mix of new and old, who knows. But we have almost a whole year to plan and prep! There is one more thing I'd like to talk about before we finish up here this evening. As I said, within Australia hats get sent to CCP. A lot of people would love to have somewhere international to post to as well. So... if you run an organisation that makes baby bereavement packs that are given to families for free in another country, and you would like to get involved for next years hat drive, PLEASE email me! (If your a member but don't actually own/run it, please pass the info on to those who do) I'm looking for 1, maybe 2 (depending on country size and location) organisations per country. So that we can start thinking about taking this global. Groups that get accepted will need to do a few things to join in (Like sharing the pattern posts on social media daily, and keeping a tally of the hats they receive for the drive, and possibly helping with pattern translation into other languages, but I may also beable to help there too) but I think overall it would be pretty incredible to see tallies from around the globe, a map with all the countries on it, and grass roots organisations in other parts of the world benefiting large scale because of the hat drive. So hit me up if you want to talk logistics for 2018! If we can hit almost 3000 in just Australia, Imagine what we can do globally!!!!!! Well lovelies, here we are. Day 30! What a month it's been! 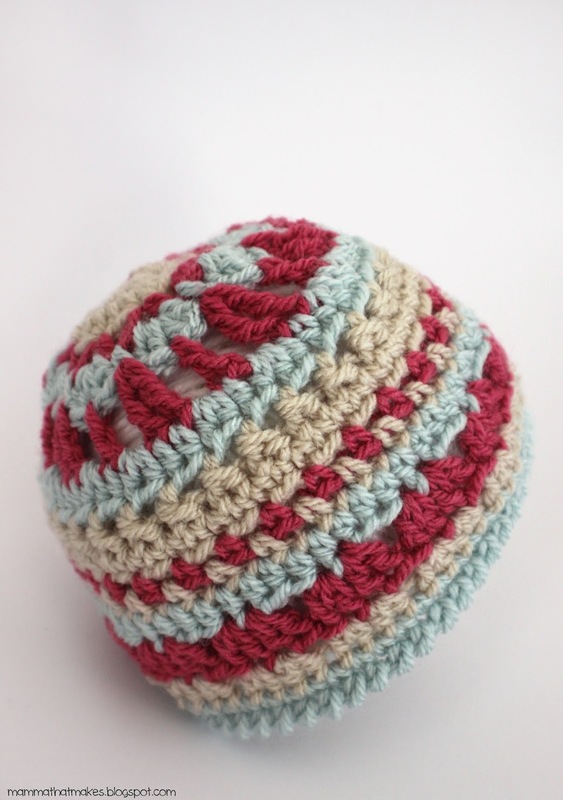 I know the ladies in the CCP crafters group have learnt a whole bunch of new stitches this past month! I have thoroughly enjoyed seeing every single photo you have shared with me this September, and have been blown away time and time again by your skills and colour choices! Amazing, simply amazing. Thankyou to everyone who joined in, regardless of if you used my patterns or not. Thankyou too for all the shares from everyone! Word of mouth is so important for events like these! I always feel a little emotional writing up the last post. It's a weird combination of relief, excitement and a bit of sad. So so many hours of work throughout the last few months, so many stitches and so much time reflecting on not only my own angels, but the ones that will eventually wear these hats, and the ones who they are named after. The next 15 days are a good time to weave in ends, add any extras and reflect on the enormously amazing contributions you have all made. 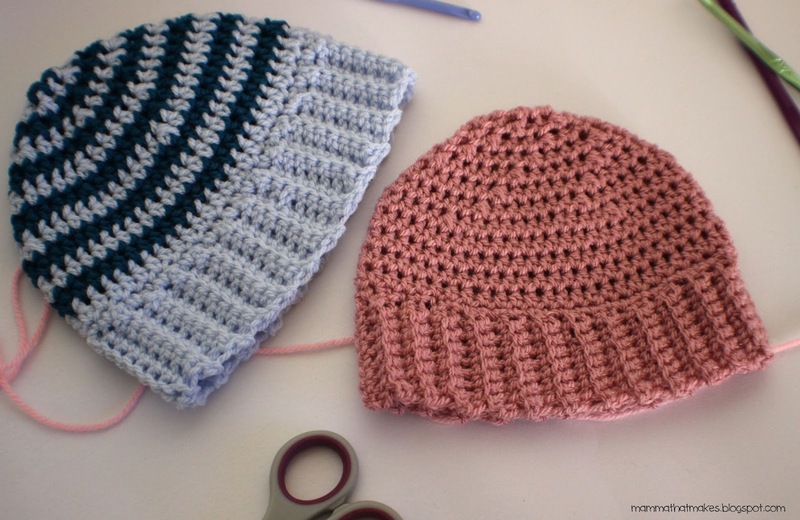 Your hats will bring a family so much comfort and love in their darkest hours. 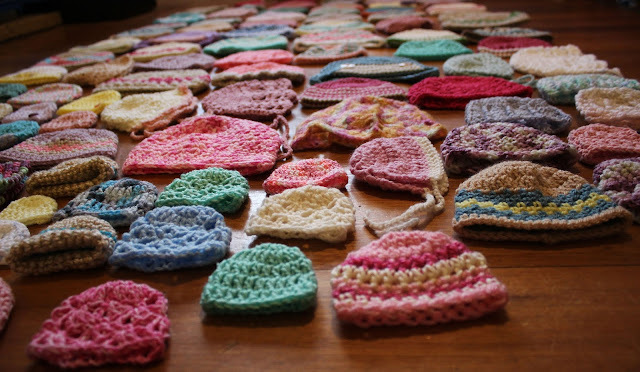 Don't forget to post your hats on the 15th, which is Pregnancy and Infant Loss Remembrance Day, Now, I know that falls on the weekend this year, so feel free to do it a few days earlier if you live somewhere that doesn't have weekend postage. 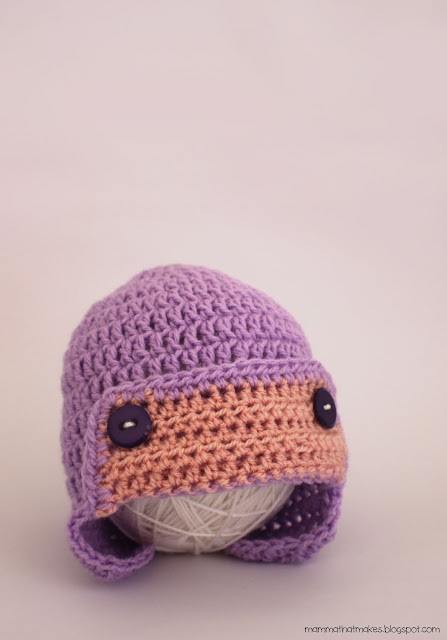 Please add a small note with the hat tally in the parcel, your town, and postcode. We love keeping tally and adding to our world map. Thankyou for joining me on this journey! DK Weight/8ply Yarn in 3 colours. End off, sew band together, being careful not to twist. Rejoin yarn to the band somewhere near the join and ch1, sc evenly for 48 stitches around the band, working in the row ends. 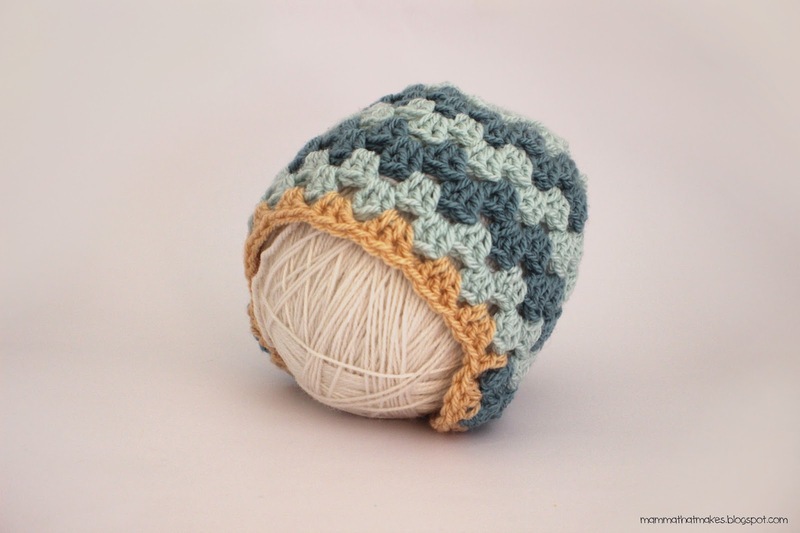 CLUSTER: *yo, insert hook into the space, draw up a loop, yo, draw yarn through two loops* repeat 2 more times in the same space, yarn over, draw through all 4 loops on hook. CLUSTER DECREASE: yo, insert hook in next ch1 space, draw up a loop, yo, draw yarn through 2 loops, yo, insert hook into next ch1 space, draw up a loop, yo, draw yarn through two loops, yo, insert hook into the same ch1 space, draw up a loop, yo, pull through 2 loops, yo, pull through all 4 loops on hook. 1: Ch2, Starting Cluster, ch1, skip the next stitch, *cluster, ch1, skip the next stitch*, repeat around, join to the first cluster. 2: slst into the ch1 space, ch2, starting cluster in the same space, ch1, *cluster in the next ch1 space, ch1*, repeat around, join to the first cluster. Change Colour 6: Slst into the first ch1 space, ch2, starting cluster in the same space, ch1, cluster in the next ch1 space, ch1, cluster decrease, ch1, *cluster in the next ch1 space, ch1, cluster in the next ch1 space, ch1, cluster decrease, ch1*, repeat 3 times, join to first cluster. Change Colour 7: Slst into the next ch1 space, ch2, starting cluster, ch1, cluster decrease, ch1, *cluster in the next ch1 space, ch1, cluster decrease, ch1*, repeat 3 times, join to first cluster. Change Colour 8: Slst into the next ch1 space, ch2, starting cluster, ch1, cluster decrease, ch1, *cluster in the next ch1 space, ch1, cluster decrease, ch1*, repeat around, ending with a cluster. Join to the first cluster. End off leaving a long tail. 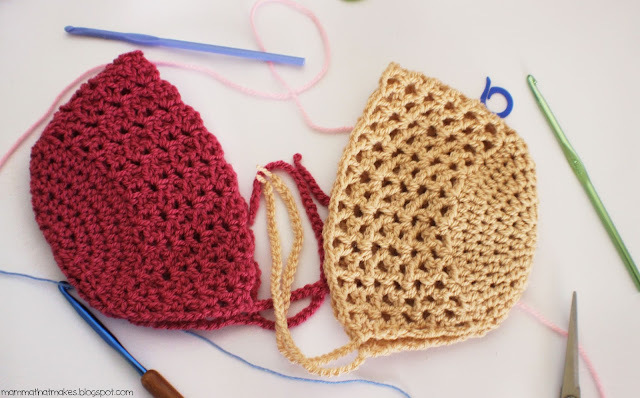 Using a darning needle, use the tail to gather the hole closed. Weave in all tails. Good morning all and hello to day 29! Wow, we are almost at the end of the month now. That's incredible! I hope everyone has been enjoying the patterns thus far! 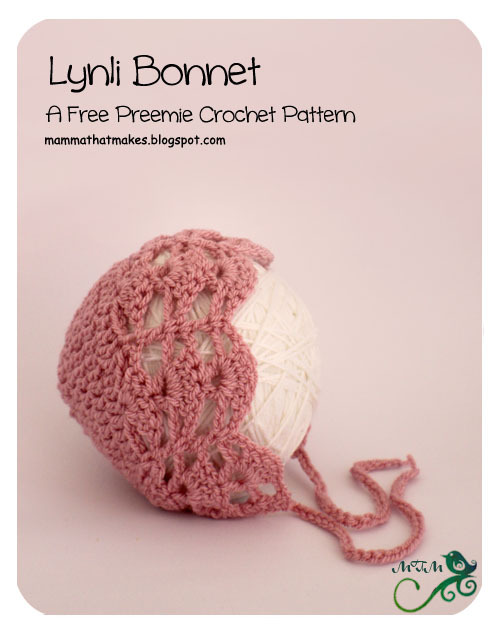 Today's pattern, the Lynli bonnet is a sweet little one that makes use of stacked shells and V stitches. 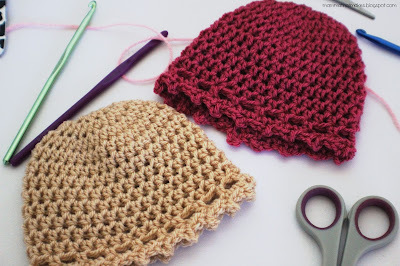 When I get a chance, I think Ill go back and add a nice big crochet flower to the side of one of these. 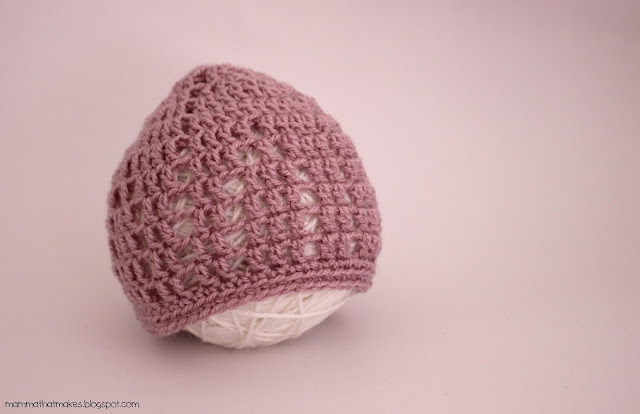 7: Ch1, turn, sc in the same stitch, ch2, sk3, 5dc in the next stitch, ch2, sk3, sc in the next stitch, *ch2, sk3, 5dc in the next stitch, ch2, sk3, sc in the next stitch*, repeat across, ending with a sc in the last stitch. 8: Turn, ch5 (counts as first dc and ch2), skip the ch2 and next 2 dc's, (dc, ch1, dc) in the next dc, ch2, skip the next 2 dcs and the ch2, dc in the next sc, *ch2, skip the next ch2 and the next 2 dc's, (dc, ch1, dc) in the next dc, ch2, skip the next 2 dc's and the ch2, dc in the next sc*, repeat across, ending with a dc in the last sc. 9: Ch5, turn, sk the ch2, 5dc in the next ch1 space, *ch2, sk the next ch2, sc in the next dc, ch2, sk the next ch2, 5dc in the next ch1 space*, repeat across ending with a dc in the 3rd ch of the previous rows ch5. 10: Turn, ch5 (counts as first dc and ch2), skip the ch2 and next 2 dc's, (dc, ch1, dc) in the next dc, ch2, skip the next 2 dcs and the ch2, dc in the next sc, *ch2, skip the next ch2 and the next 2 dc's, (dc, ch1, dc) in the next dc, ch2, skip the next 2 dc's and the ch2, dc in the next sc*, repeat across, ending with a dc in the 3rd ch of the previous rounds ch5. 11.: Ch5, turn, sk the ch2, 5dc in the next ch1 space, *ch2, sk the next ch2, sc in the next dc, ch2, sk the next ch2, 5dc in the next ch1 space*, repeat across ending with a dc in the 3rd ch of the previous rows ch5. Rejoin yarn to the other corner and ch35 to make the second tie. Good morning all and welcome to day 28! 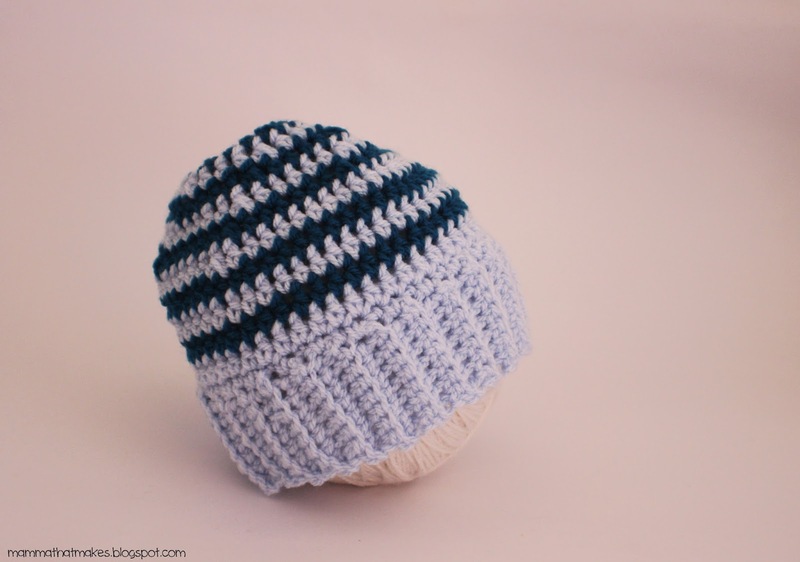 Today's beanie was a really fun one to design, and something I don't do often enough! 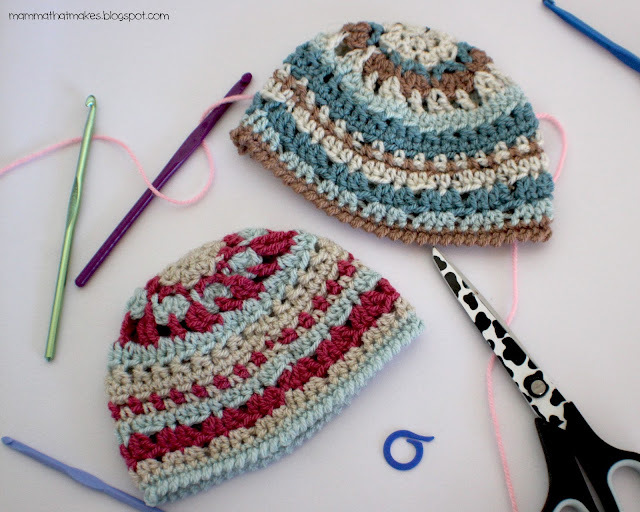 Mixing stitches! 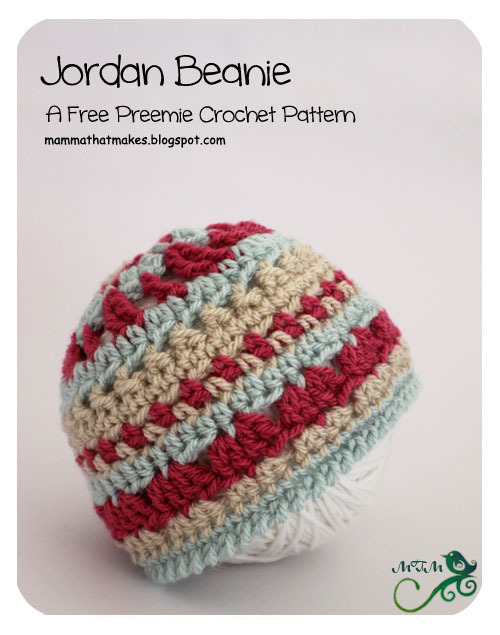 The Jordan beanie is sized to fit 38 week preemies. It features a variety of stitches, and when mixed with various coloured yarns it creates something pretty special indeed. I haven't given any instructions on how many colours to use. That is your choice, and a part of the fun of a pattern like this! 15. Ch1, crab stitch around, join to the ch1. End off and weave in all tails. Good morning lovelies and welcome to day 27! Ohh I actually love the number 27! It's my birthday number (of course, that's back in May, but still!) 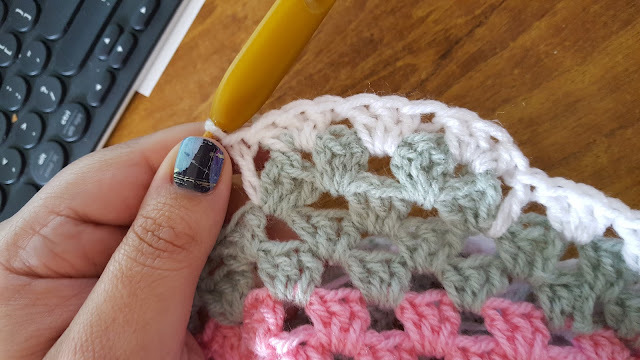 I also LOVE today's pattern! 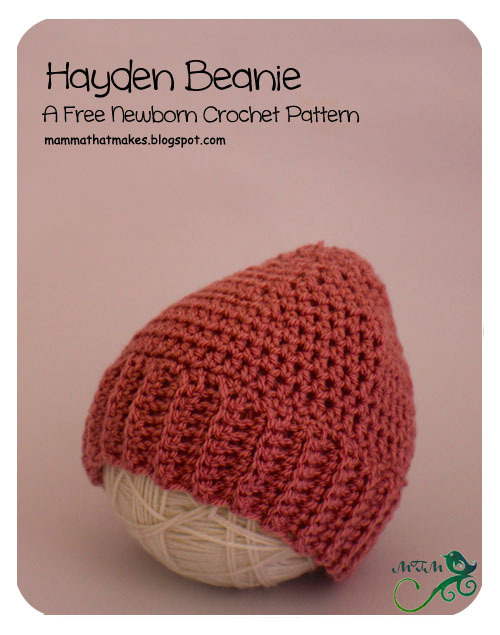 The Hayden Beanie, is a little unique, in that it's made bottom up! That's right, we make the band first. 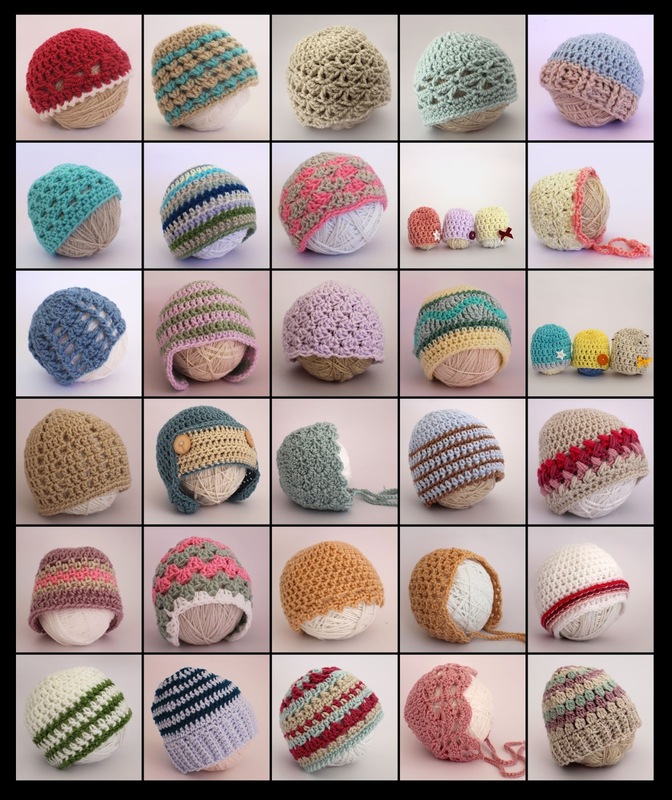 Now, I know that sometimes counting rows, especially lots of them, can be a right pain, but I use this handy page to keep track! Row Counter is an awesome and simple site, just input your number of rows needed and off you go! So much easier to keep track! End off, leaving a long tail. Sew the back together at the ends, being careful not to twist. Leave a long tail and end off. Use the tail to gather the opening closed and finish off, weaving in all tails. Use a contrasting colour for the band only. 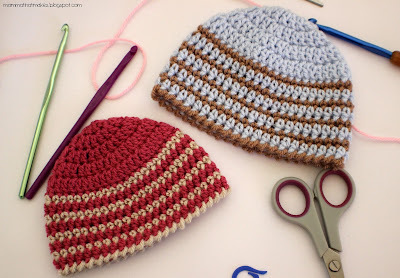 Alternate colours to make stripes on the body of the hat. Good morning all! Welcome to day 26! If you are a long time follower, you might remember Lisa designed for us the Charlot and Charlie Cocoon. Pop on over to her Facebook Page and say hi! 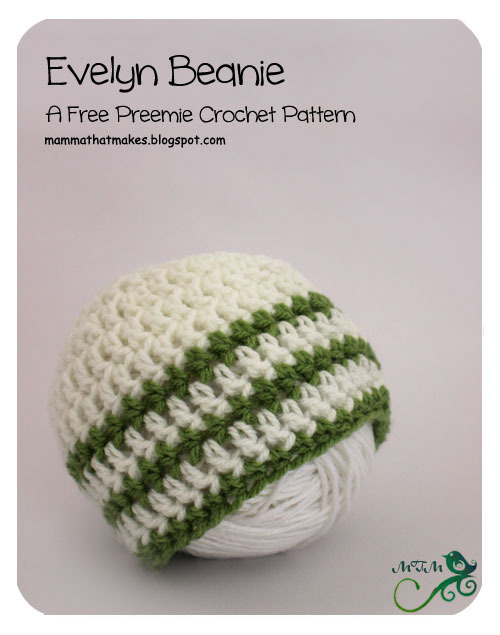 The Evelyn Beanie, will fit a bub of about 36-38 weeks gestation and is a super fast beanie to whip up! The chains at the beginning of each round do not count as a stitch they just give you the height for the stitches in that row. 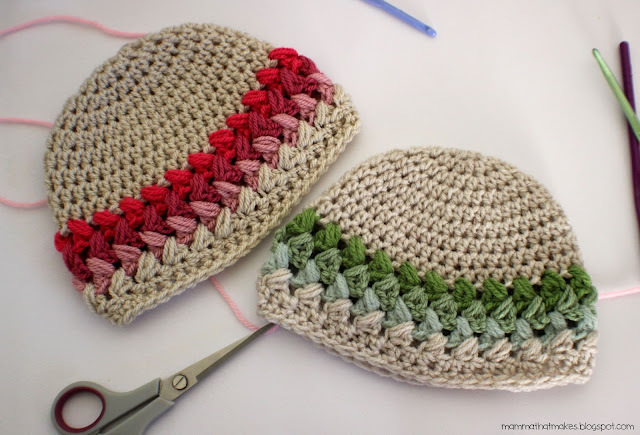 Join to stitch not ch. First stitch made in same space as chain. End off an weave in all tails. Good morning all and welcome to day 25!!! 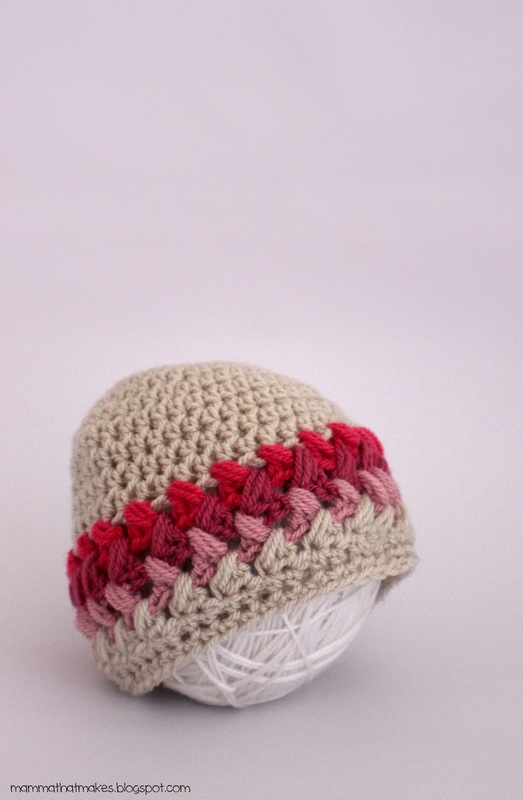 Today's beanie, the Quirt, is designed for a full term 40 week newborn. However, drop off one increase round and you'll have a size to fit a 38 week preemie. 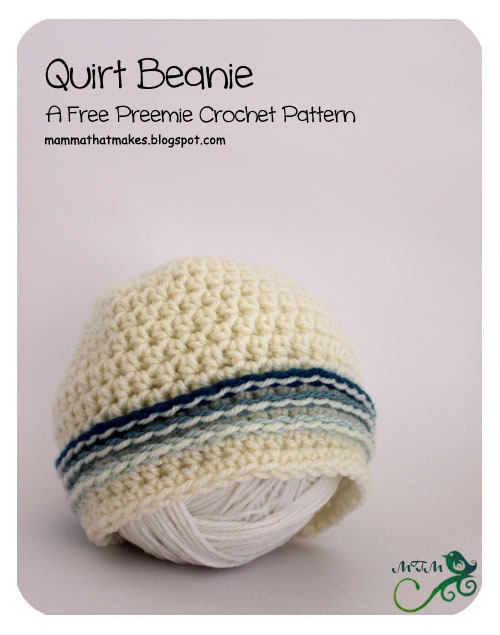 The quirt hat makes use of slip stitches to create a textured section. I used 3 shades of the same colour for mine to create an ombre effect, but you could use any colours. 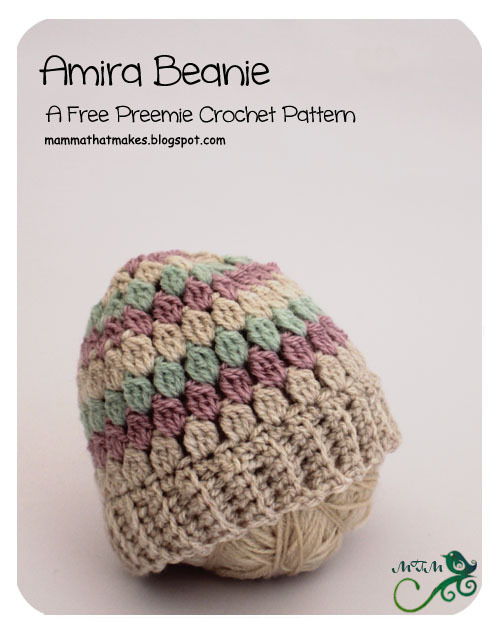 This is a great beanie to use up those few remaining meters of colour! 40 weeks gestation, full term newborn. Skip this increase for 38 week size. 6-12: Ch2, hdc in each stitch around, join to the ch2. 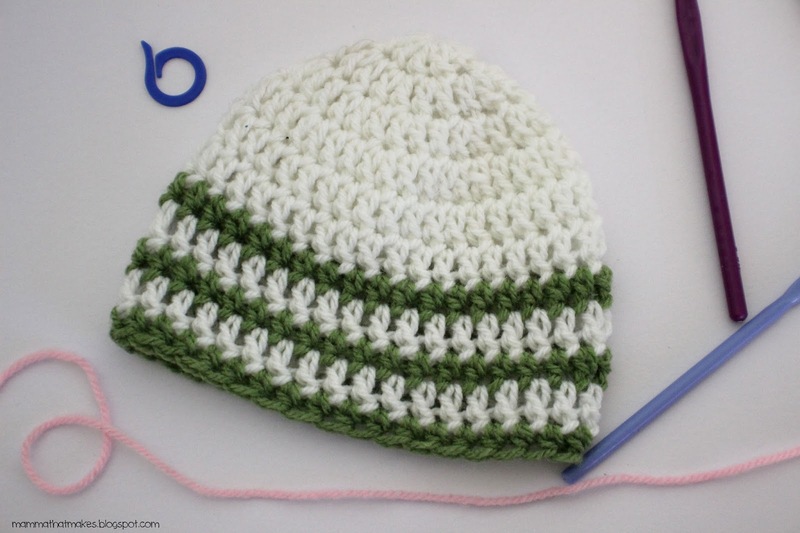 13-15: Ch2, hdc in each stitch around, back loops only, join to the ch2. 16: Ch1, sc in each st around, join to the ch1. 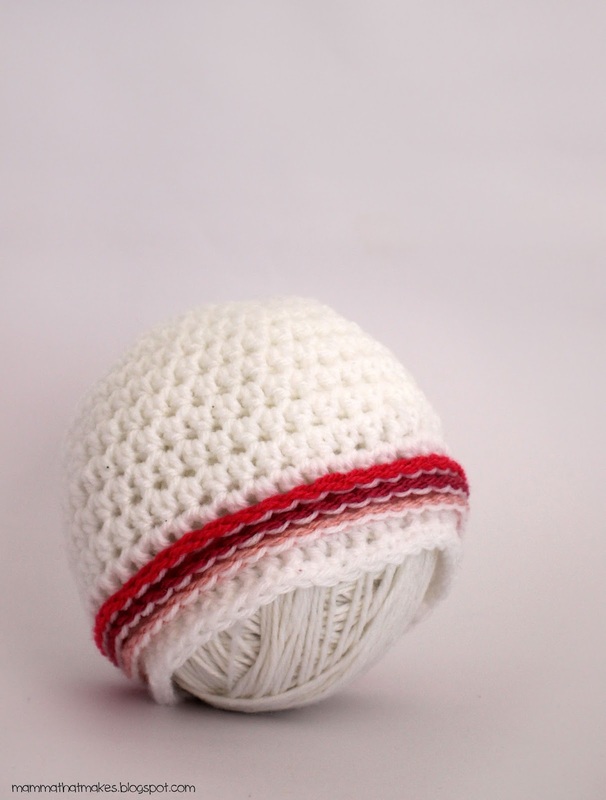 Using various coloured yarn, attach to the loops left from rounds 13-15 and sl st in each stitch around. Sl st loosely or go up a size in hook to ensure they don't pull tight. I find instead of slst to the first slst to join the round, just end off with the last slst into the last loop, and tie the ends together before weaving them in. It creates less bulk. Good morning all and welcome to day 24! 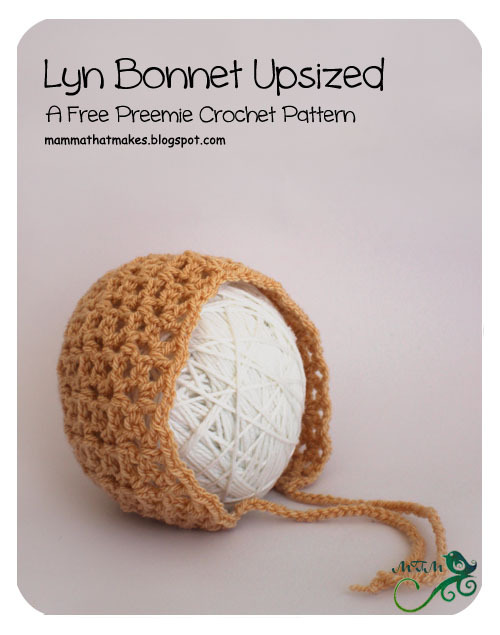 Today's beanie is our last resize for the year, and this time it's the Lyn Bonnet. Ive had so many people ask for this one in a larger size, so here it is!!! 7. Ch3, turn, (dc, ch2, sc) in the next stitch, *skip 2 stitches, (dc, ch2, sc) in the next stitch*, repeat around, sc in the last stitch. 8. Ch2, turn, skip sc, (dc, ch2, sc) in the 1st ch2 space, *(dc, ch2, sc) in the next ch2 space*, repeat around, sc in the top of the turning chain. At the end of row 12 chain 35 and then end off. This forms one tie. 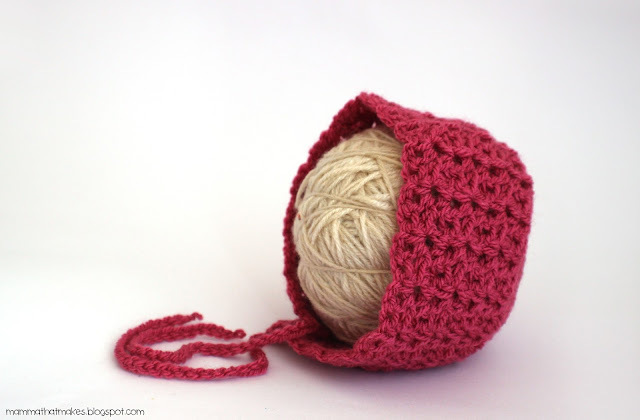 Join the yarn to the other corner with a slst and chain 35 for the second tie. End off. Weave in tails. Good morning all and hello day 23! 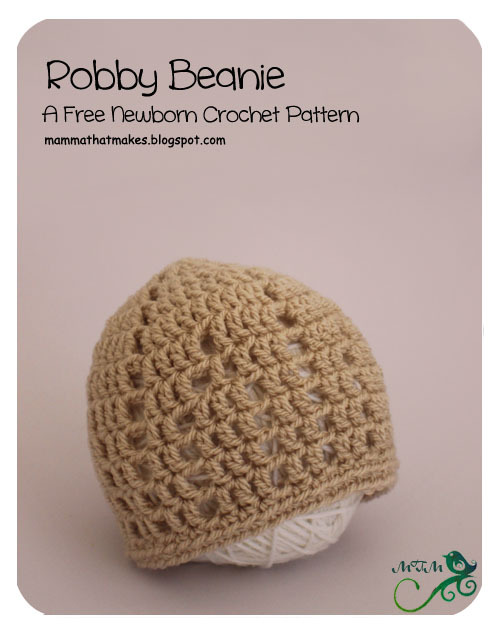 Today's beanie is another great beginner beanie. 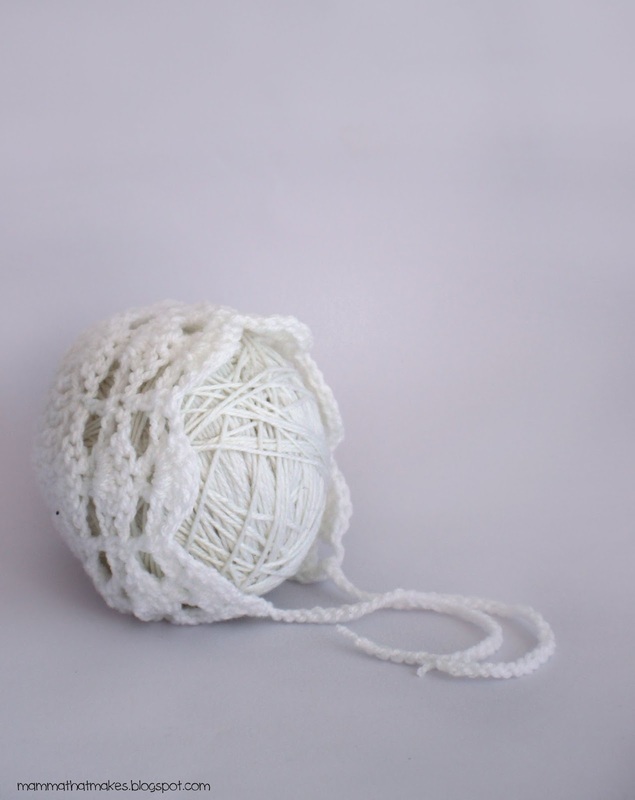 Proving that you don't need fancy stitches to make something delicate and sweet. 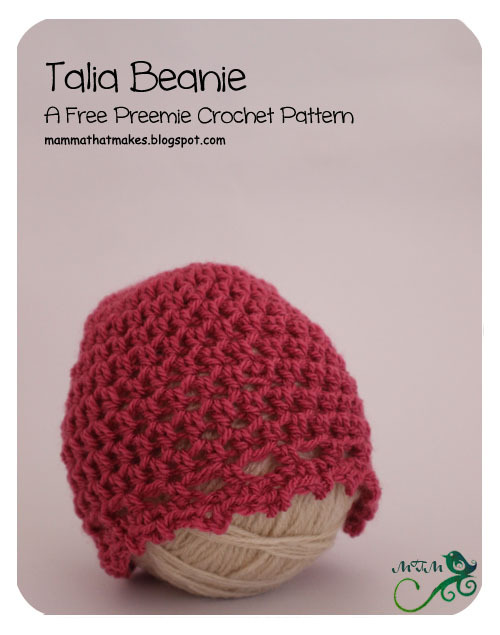 This Talia beanie uses a simple edging of skipped stitches and picots to give it all it's charm. Picot: ch3, slst into the first chain. 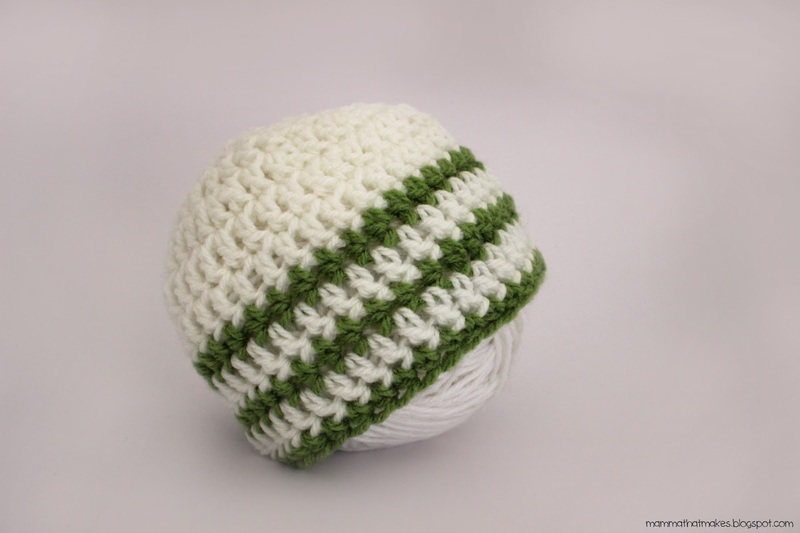 Picot made. 12: Ch3 (counts as first hdc and ch1), skip 1 stitch, *hdc in the next stitch, ch1, skip 1 stitch* repeat around, join to the 2nd chain of the ch3. 13: Ch1, sc in the same stitch, sc in the ch1 space, picot, *sc in the next stitch, sc in the ch1 space, picot*, repeat around, join to the ch1. End off, weaving in all tails. Good morning all and welcome to day 22. 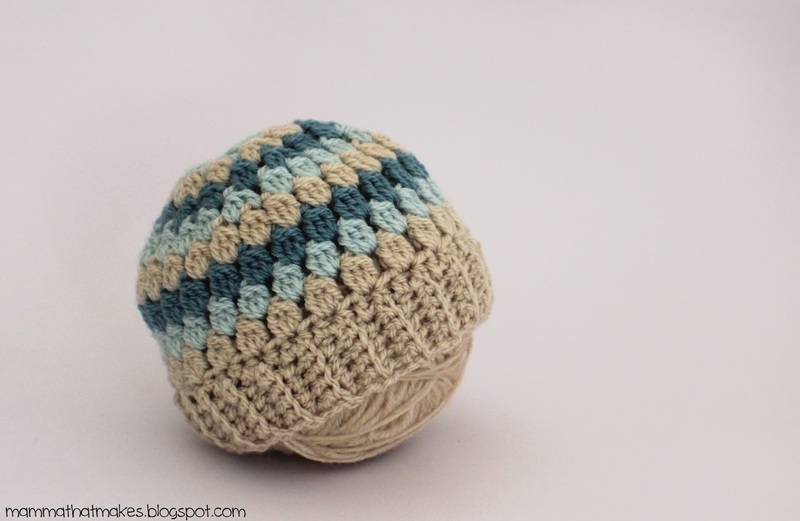 Today's beanie is an upsize! 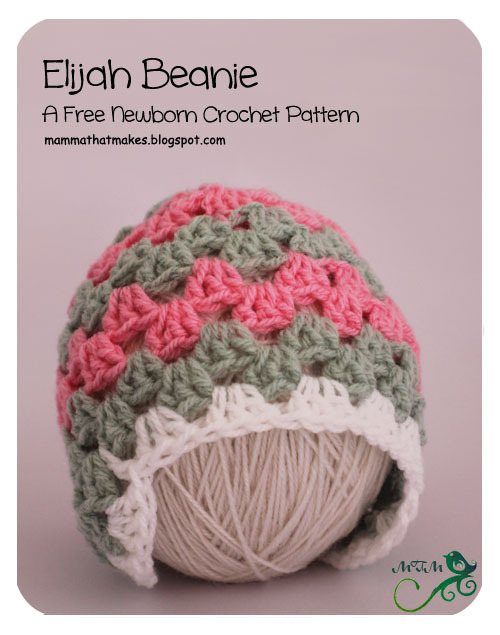 The Elijah beanie, a classic granny stitch earflap beanie, has been redesigned so it will now fit a full term newborn. I love this style, and according to the numerous upsize requests, so do you guys! NOTE: For the sake of easy writing, each ch1 gap and each space between clusters will both be referred to as spaces. 12. Join yarn to the space in the middle of an earflap, ch3, 2dc in the same space, 3dc in the ch1 space, dc once in the same space as the 3dc cluster from the previous round (view photo below to see location), 3dc in each space until you reach the next earflap, dc once in the same space as the previous 3dc cluster, 3dc in the ch1 space, 3dc in the next space, 3dc in the next ch1 space, dc in the same space as the 3dc cluster from previous round, 3dc in each space until you reach the 1st earflap, dc in the same space as the 3dc cluster from the previous round, 3dc in the ch1 space, join to the starting ch3. End off, weave in all tails. Hello hello day 21! Gee, the end of our third week! Incredible! 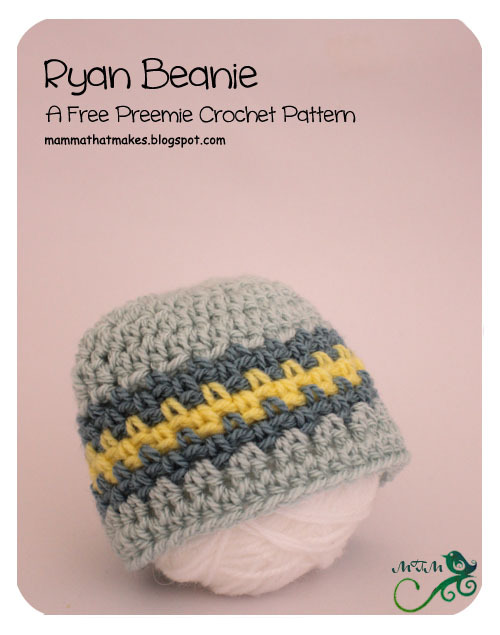 Today's pattern, the Ryan beanie, is a sweet and small beanie, for 28-30 weeks gestation and features the seed stitch, and clever colour changes, to make zigzag stripes. Take note though, you will need a light hand for this one, as sc stitches can tend to get a bit tight, and won't have as much stretch as the hdc's do. It's such a pretty stitch though! 7: Ch2 (counts as sc and ch1), skip 1 stitch, *sc in the next stitch, ch1, skip 1 stitch*, repeat around, join to the first chain of the ch2. 8: Slst into the ch2 space and ch2 (counts as first sc and ch1), (sc, ch1) in each ch1 space around. Join to the first ch of the ch2. *note: Pay attention to where the last sc+ch1 go, its easy to miss it because of the initial slst. 13-14: Ch2, hdc in each st and ch1 space around, join to the ch2. Good Morning all and welcome to day 20! Gosh, only 10 days left! Today's pattern is something a little different. 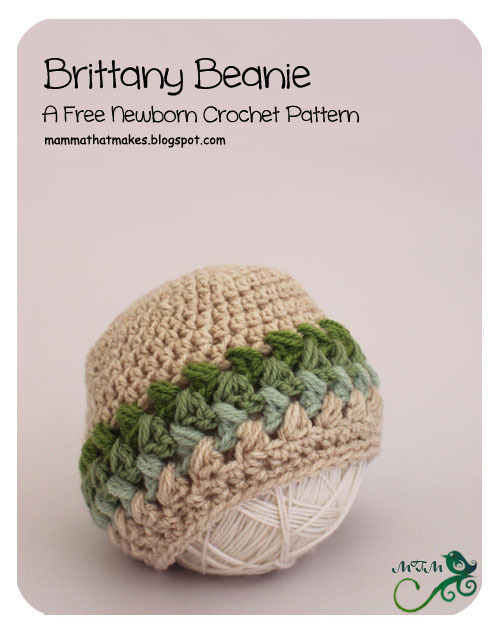 The Brittany beanie features zigzag puffs!!! Now, given how puffy the puffs are, this beanie is quite large, and probably the largest one in the collection this year. It will easily fit a 9-10lb baby. But, thats ok! Because as we know, sadly angels come in all sizes, and some wonderful charities out there also provide hats to babbas that are a bit older. Im glad to have something to offer for this size range. Having said that, if you want to make this one smaller, I would suggest dropping to a 4mm hook AND leaving out round 5 increases. 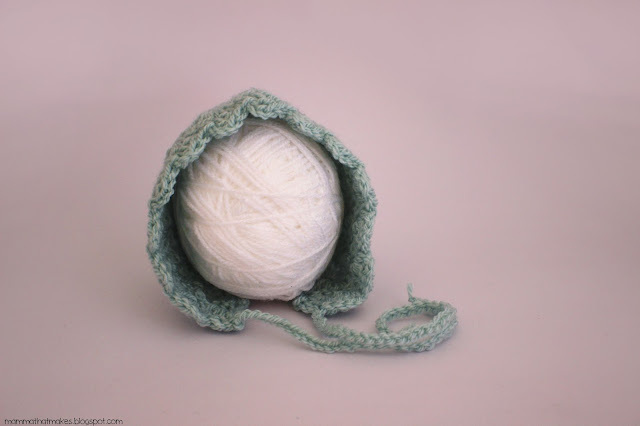 Puffs need to be kept tight, so if your having tension problems, you could downsize your hook for those rounds too. 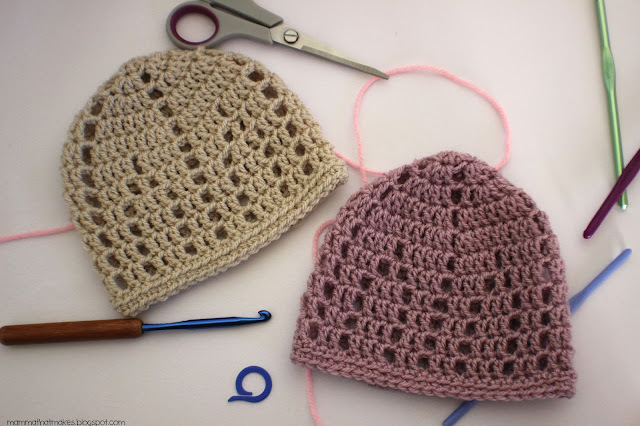 10: Ch3, puff stitch in the hdc BEFORE the ch3, ch1, *skip the next stitch, dc in the next stitch, puff stitch in the skipped stitch, ch1*, repeat around, when you get to the last puff stitch ch1 and join to the ch3. 11: Ch3, turn, puff stitch in between the last 2 puffs from the previous row, ch1, *skip the next stitch (ch1) and dc in the top of the next puff, puff stitch in the space between the last 2 puffs (see photo), ch1*, repeat around, join to the top of the ch3. 12: Ch3, turn, puff stitch in between the last 2 puffs from the previous row, ch1, *skip the next stitch (ch1) and dc in the top of the next puff, ch1, puff stitch in the space between the last 2 puffs (see photo), ch1*, repeat around, join to the top of the ch3. 13: Ch3, turn, puff stitch in between the last 2 puffs from the previous row, ch1, *skip the next stitch (ch1) and hdc in the top of the next puff, ch1, puff stitch in the space between the last 2 puffs (see photo), ch1*, repeat around, join to the top of the ch3. 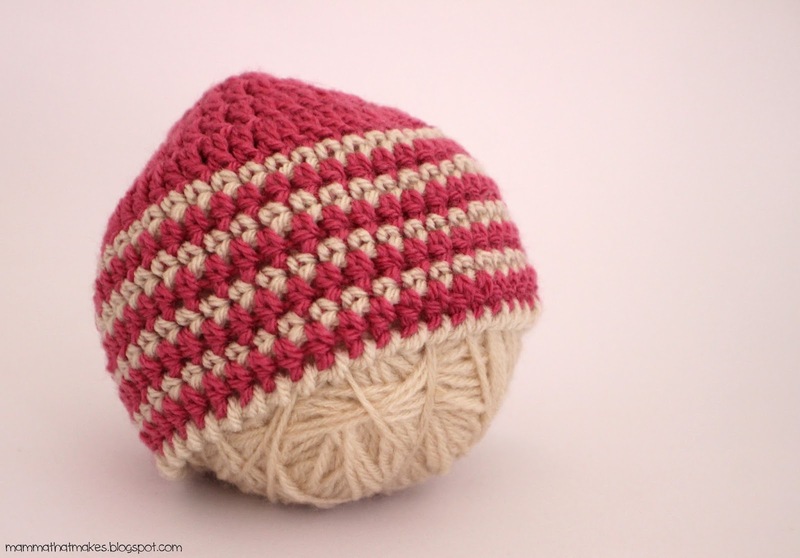 14: Ch2, turn, hdc in the top of each puff stitch and each ch1 (skip all dc stitches), join to the ch2. 15: Ch1, sc in each stitch around, join to ch1. Good morning all and a warm welcome to day 19. 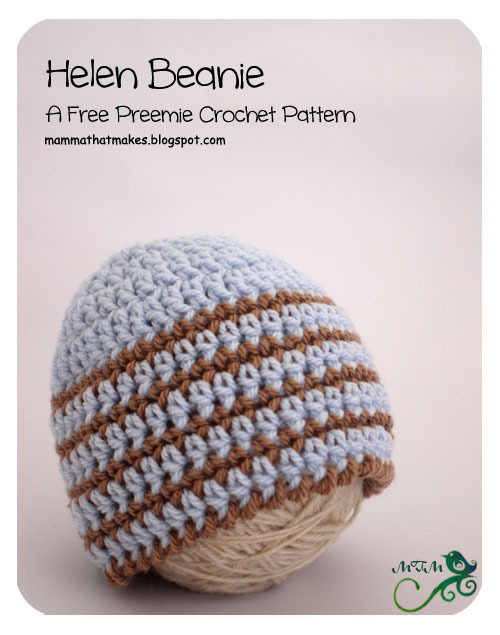 Today's beanie, the Helen, is a simple pattern that uses alternating rounds of hdc and sc to make some stripes! I love how they are different sizes! 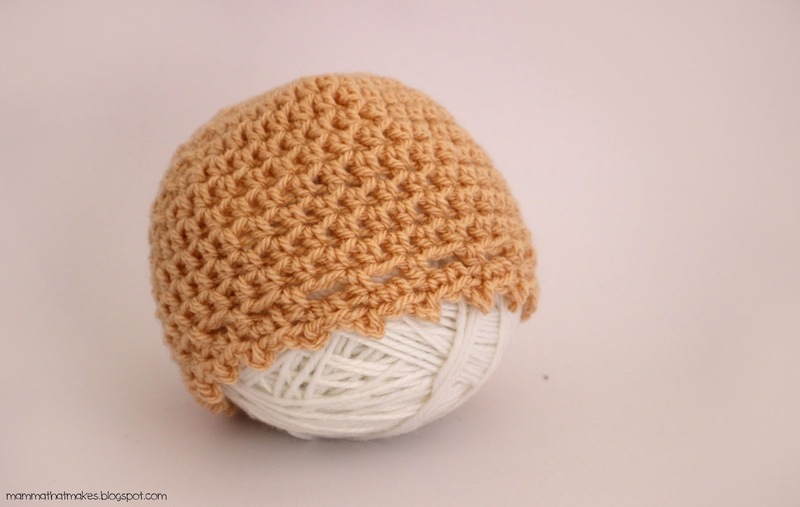 It's also finished with the crab stitch, which I am totally in love with right now. It's such a simple way to add a bit of texture to a beanie! 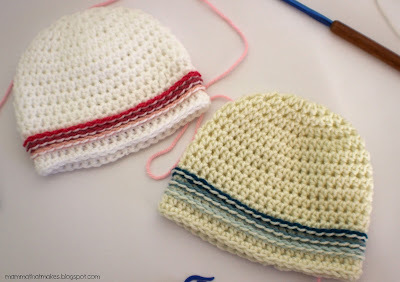 6: Ch1, sc in each stitch around, join to the ch1. 7: Ch2, hdc in each stitch around, join to the ch2. 8-13: Repeat rows 6 and 7 3 times, remembering to change colours each round. 14: Change to contrasting colour, crab stitch (reverse sc) in each stitch around. slst to join. Good morning lovelies and helloooooo day 18! 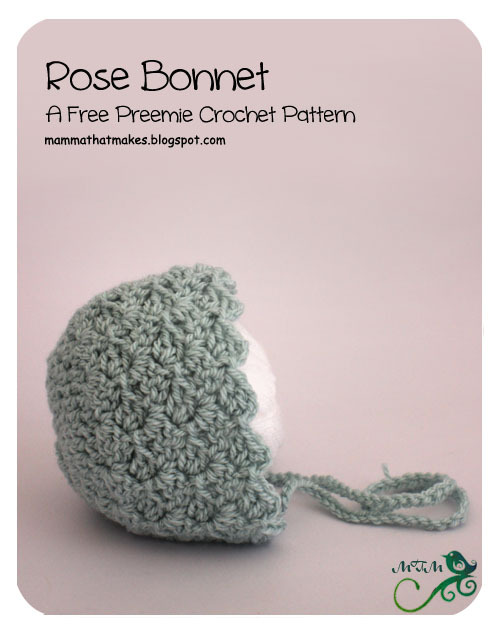 Today's pattern is another upsize, this time of the Rose Bonnet, which was released for the last hat drive, but was sized super itty bitty tiny! This new version will fit 30 weeks gestation. 6. Ch1, turn, in the first stitch (slst, ch3, 2dc), shell made *skip 2 stitches, (slst, ch3, 2dc) in the next stitch, repeat around, sc in the last stitch. 7. Ch1, turn, (slst, ch3, 2dc) in the sc, *in the ch3 space of the next shell (slst, ch3, 2dc), repeat across, when you reach the last shell, sc in the ch3 space. 12. Do not turn, ch1, sc evenly along the base of the bonnet (neck area) when you reach the corner chain 35. End off. 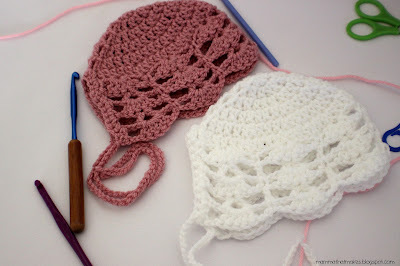 Join yarn to opposite corner and chain 35 for the second tie. Good morning all and hello day 17! 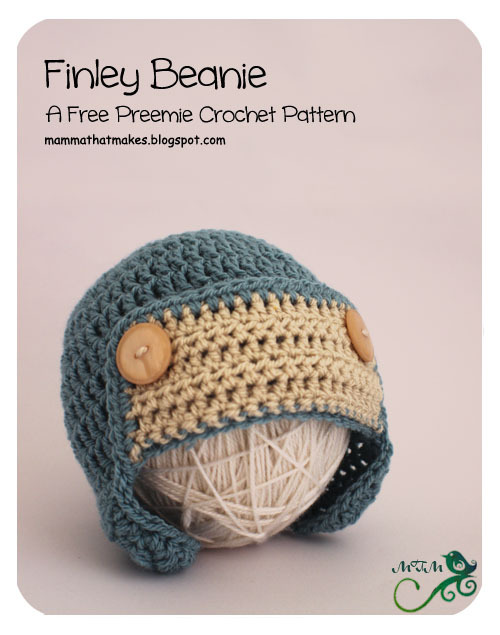 Today's pattern is the Finley beanie, and it's a sweet little aviator style. I love how sweet these look on! This beanie is sized for a full term newborn. 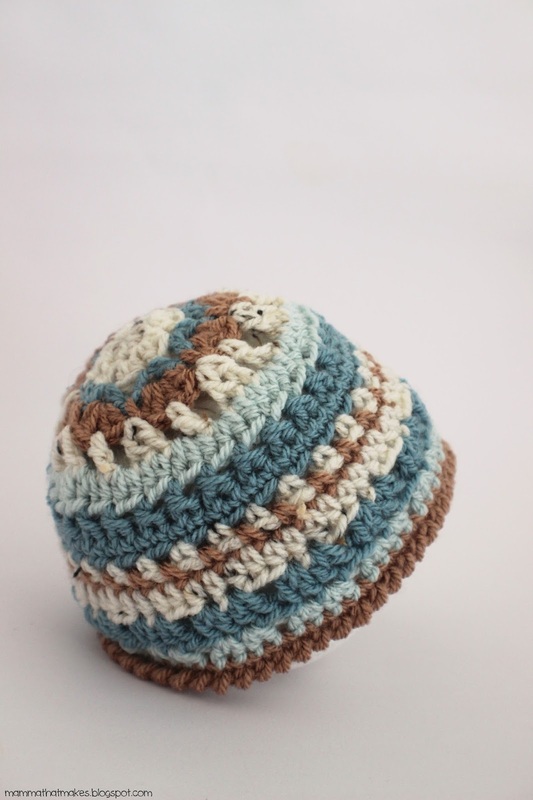 It's so nice to have a range of full term sizes in the hat drive this year. 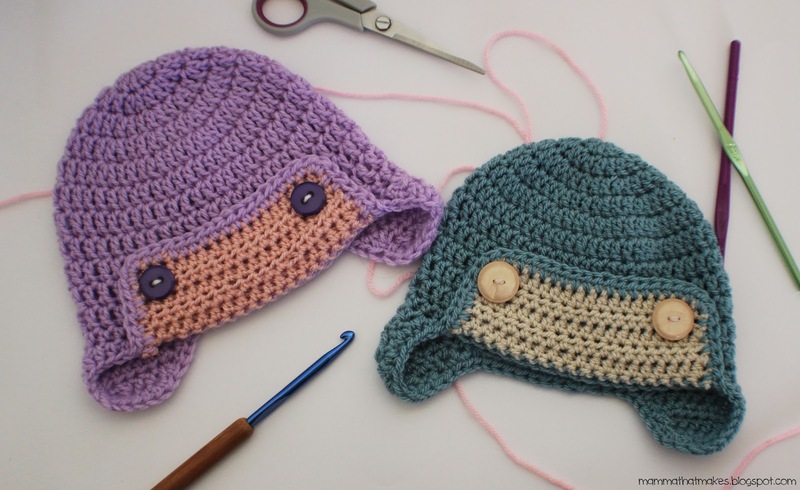 Most organisations I know support loss at every gestation (and some even into the first year) and so I'm really pleased to be able to offer patterns for those families too. I havn't tried this one with stripes yet, but I bet it would be just as good! Another alternative would be to crab stitch the final round to change it up even more! DK Weight/8ply yarn, in a main and contrasting colour. 1: Slst in the next 8 stitches, ch2, hdc in the same stitch, hdc in the next 7 stitches. 2: Ch2, turn, hdc in all 8 stitches. End off, weave in all tails. 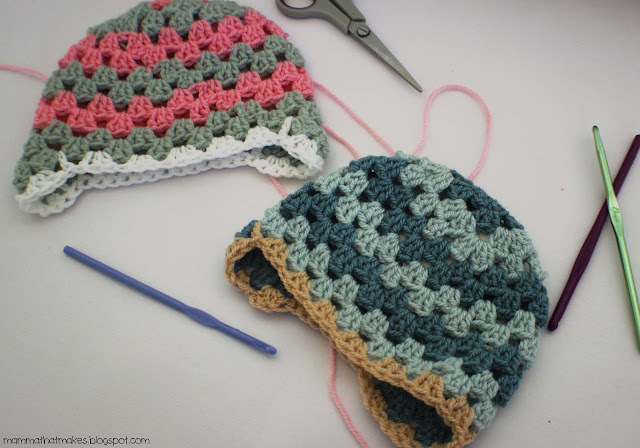 1: At the front of the hat, 2 stitches from the left of the right side earflap attach yarn to the front loop only. Ch1, sc in the same stitch and the next 18 stitches, using the front loops only. 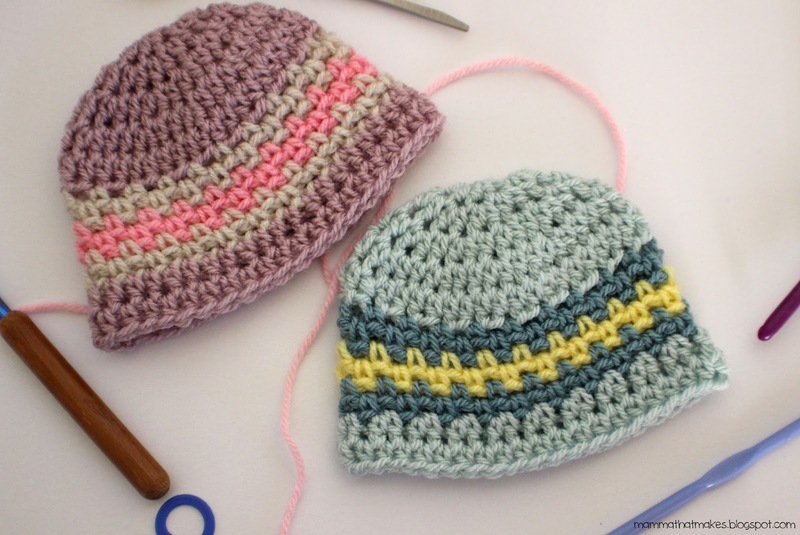 2-6: Ch2, turn, hdc in each stitch across. End off, weaving in tails. Reattach main colour to rear of hat in any stitch, ch2, hdc in the same stitch, hdc around entire hat edge, including earflaps and brim. When you get to the earflaps, it helps to add a few extra hdc's on the corners of them to prevent curling. 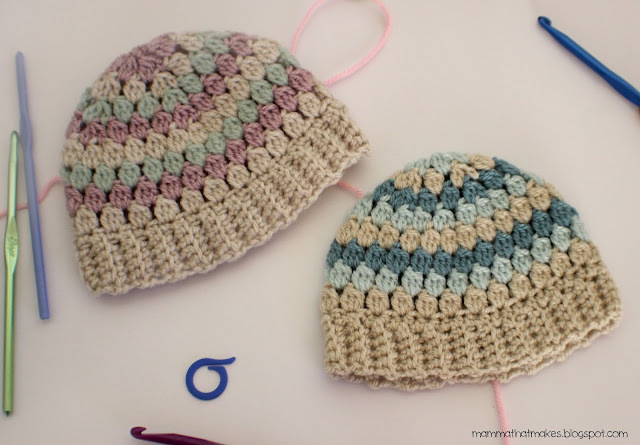 Fold brim up, tack into place, and add 2 buttons to decorate. Good morning all and welcome to day 16. 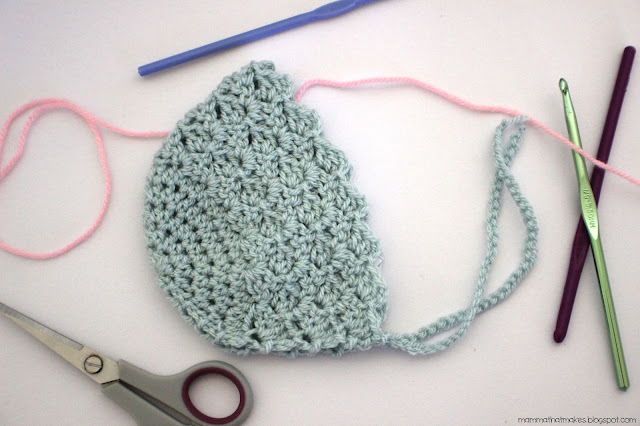 9: Ch3, dc in the next stitch, , ch1, skip the next ch, dc in the next 3 stitches, ch1, skip the next chain, dc in the next 2 stitches, ch1, skip the next chain, *dc in the next 2 stitches, ch1, skip the next chain, dc in the next 3 stitches, ch1, skip the next chain, dc in the next 2 stitches, ch1, ski the next chain*, repeat around, join to the ch1.